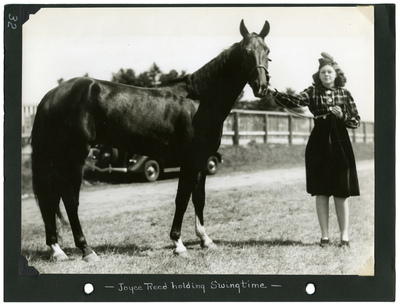 Black and white portrait of bay gelding, pacer Swingtime, held by Joyce Reed near the sheds at Cumberland County Fair Grounds. Joyce Reed was approximately 15 years old, and the daughter of George W. Reed. George and his brother, Walter M. Reed, Sr., were potato farmers from Fort Fairfield who also built a large stable of standard bred horses. Walter Reed's son, John Hathaway Reed went on to become Maine's 67th Governor.